The Oil States TapAble Flange is a cost-effective, pressure- containing alternative to a subsea valve tie-in. The flange reduces the cost of fabrication time associated with a typical subsea valve assembly. When ready for the lateral tie-in, a hot-tap machine is installed to tap out the flange blank. 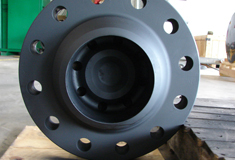 The flange is machined from a single, A694 forging, which eliminates welding issues and possible project-specific C.E. requirements associated with cast flanges. See TapAble Flange animation here. Provides pressure containment without the use of a subsea valve. Lower cost than a valve, from manufacturing to installation. Unique tapping machine that is user friendly. Forged body construction eliminates welding issues with cast flanges. Less costly than mechanical hot tap clamps.